In 1933 The Soviet Union became afraid of the “peasnatization” of the workforce. As the ideal underclass was the proletariat efforts to educate the largely literate and unskilled work force began.5 This organized system of education proved to be less effective than on the job training, during which individuals were instilled with the belief that with even the smallest extra effort they could become a hero to the Soviet Union. These sentiments gave rise to workplace competition and national pride. With the issue of desertion sill prominent within the city, a passport system was created. The passports, which could have prevented the misuse of trains and government money, became an opportunity for the rise of black markets because of the demand for documentation. Even after many of the pitfalls of Magnitogorsk, it is still viewed as a successful industrial center that taught its citizens national pride and created a trained working class. What struck me as I read the article was the need for progress, even when nothing was in fact achieved. The construction of the damn is the greatest instance of a failed but somehow respected occurrence. While it is true that the damn was built ahead of schedule and as a result party authority vastly increased, the damn was not functional and almost as soon as construction was completed it once again began.6 Thant the Soviet Union was able to turn a major construction failure into a morale booster and convince the workers that even “the lowest individual could become a great hero by straining to pour an extra load of cement” is a testament to the strength of the collective mindset7 The ability of the Bolsheviks to deftly turn a critique of their shortcomings into a party asset is one of the many characteristics that helped to keep the party in power during the Soviet Union. 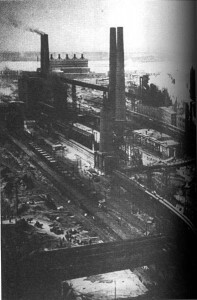 This entry was posted in HIST254-Archive and tagged Collectivization., industrialization, Magnitogorsk, Russia, soviet union by maureen. Bookmark the permalink. I think your remarks on the overwhelming need for progress despite failures just about sums up the vision of the Soviet Union at the time. It is incredibly impressive that the Soviet Union was able to turn such failures into motivators. This point reminds me of Hoffman’s article “European Modernity and Soviet Socialism”, and how he argues to extend the definition of modernity to include progress. Once progress is considered, one can draw parallels in modernization amongst the Soviet Union and the nations of the west. It was this constant drive for progress that brought the Soviet Union to modernity and that allowed it to keep up with the world powers of the west despite its shortcomings in policies.